The Swiss Museum of Transport in Lucerne is presenting a special exhibition, NRLA – gate to the south. It runs until 23 October 2016. 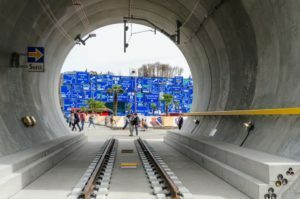 The focus of the exhibition is on the new Gotthard Base Tunnel, which is being inaugurated on 1 June. REX as a international manufacturer of rubber and rubber-metal products for the rail industry is presenting and informing how civil engineering changed all our life in the alps, europe and the world. Several innovative products engineered by REX are on display as a contribution to give the visitor a real feel for the technological challenges and problems we solved in the past century. We are proud and happy to be able to not only make mobility happen but also to inform and inspire all people about the engineering feats REX and other companies managed to deliver. We would like to welcome you at the NRLA Mobility Exhibition whose website you can find here.